We didn’t tell them where we were going so it was a big surprise when we arrived! Our Christmas Experience was booked for midday so we had an hour and a half exploring the Zoo itself before heading down the main house, which had been decked out beautifully outside with a large Christmas tree, some snow and lots of lit up trees, it was almost a shame it was such a bright and sunny day but I know it would look even more picturesque for those booked on evening sessions. 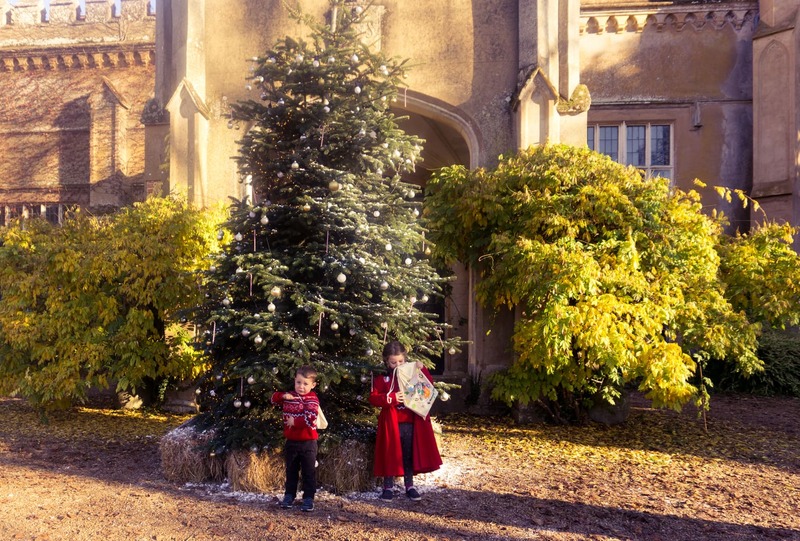 We were ushered inside right on time and took a seat to enjoy a mince pie or shortbread Christmas tree biscuit and a glass of mulled one or squash for the kids and drank in the atmosphere. 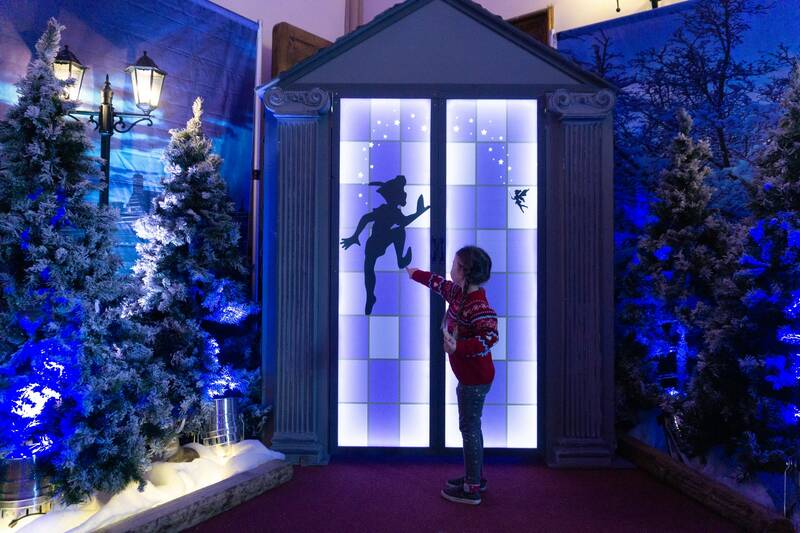 This year the theme was Peter Pan, so the entrance room had been done up with a peter pan shadow flying above our heads, lots of trees and sign posts a big interactive screen showing the names of those on the naughty and nice lists. All the kids who were visiting that day were on the nice list, and there were lots of traditional baddies on the naughty list – Athena loved trying to spot some of the ones she new! 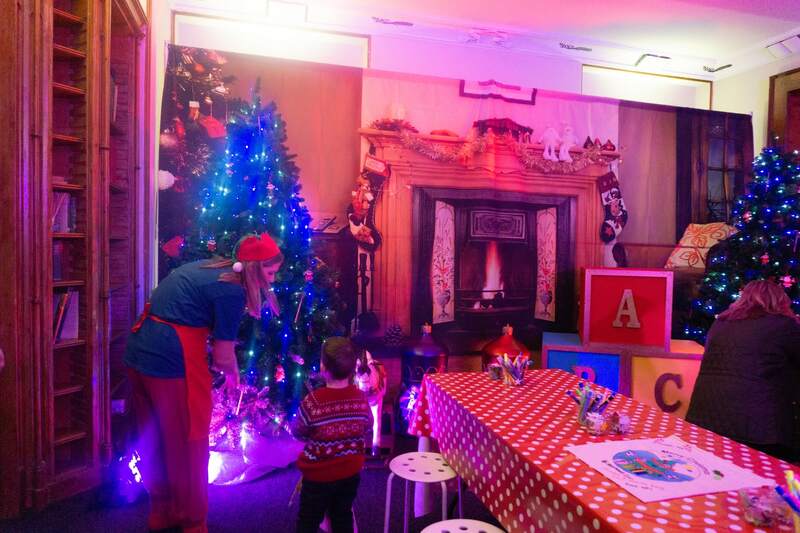 After the whole group had arrived we headed through the doors and down the corridor to the next room, which was set up beautifully and full of Peter Pan props and characters, including Tick-Tock the crocodile! 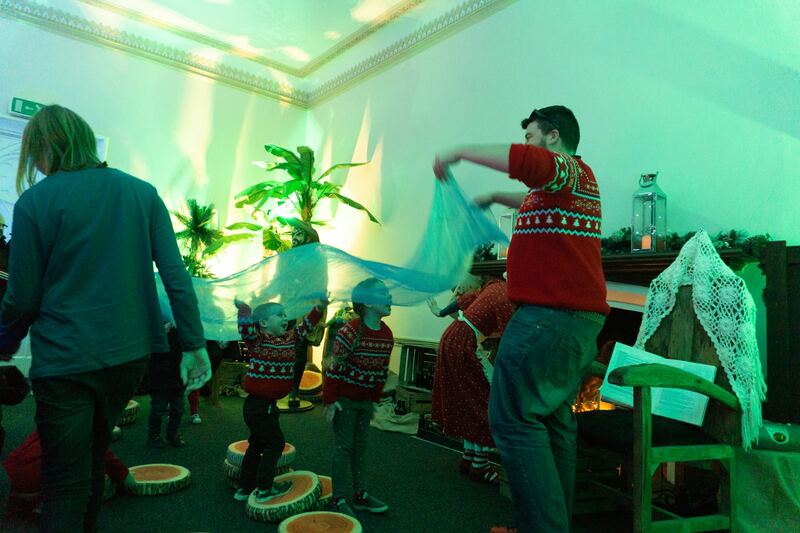 Once we were all settled (along benches for adults and tree stump cushions for the kids) we were treated to some of the story of Peter Pan, with some puppets, songs, lighting and some awesome audience interaction too – Sam got up to help! Everyone in our group was really entranced by this and it was over too soon. 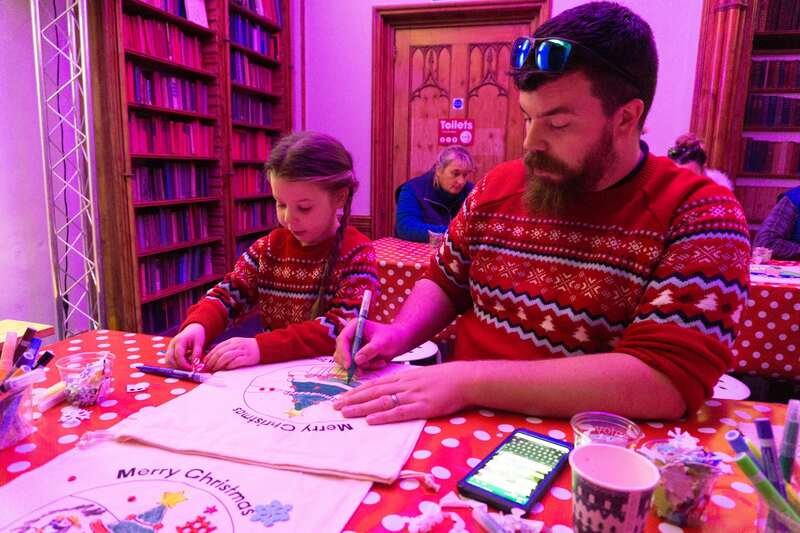 Next the elves arrived to usher us through into the craft room, where the kids got given a printed cloth bag and lots of fabric pens and stickers so that they could decorate them however they wished! As we were doing this the elves came round and chatted to the families, cleverly working out what the kids names were so they could pass this info onto Father Christmas. 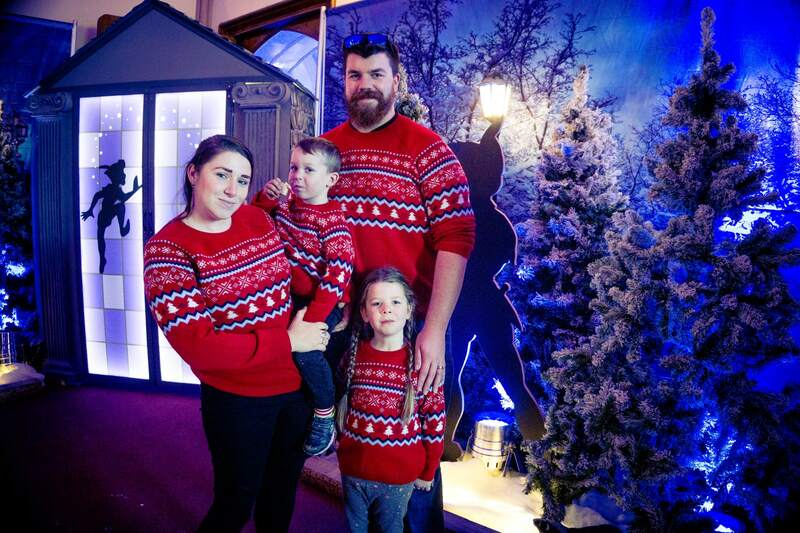 We’d gone all out in matching Christmas jumpers and all the elves commented on them. They were chatting to the kids about the Peter Pan story we’d just seen, asking them what they might want for Christmas and soon, they were so good at interacting with the kids and all looked the part too with costumes and full faces of make up! 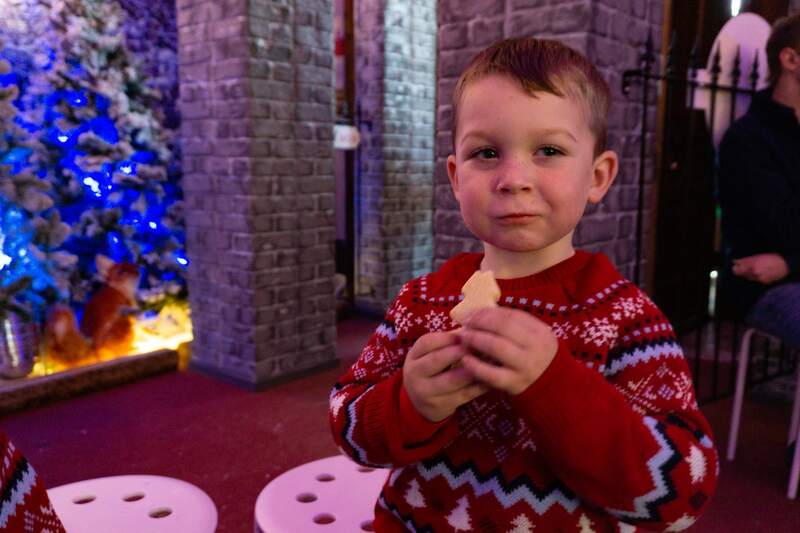 When it was time for us to go through to see Father Christmas the kids were SO excited, and when they ran in to see him and he knew their names already they had no problem settling down on the stools and chatting to him about what they’d like for Christmas. 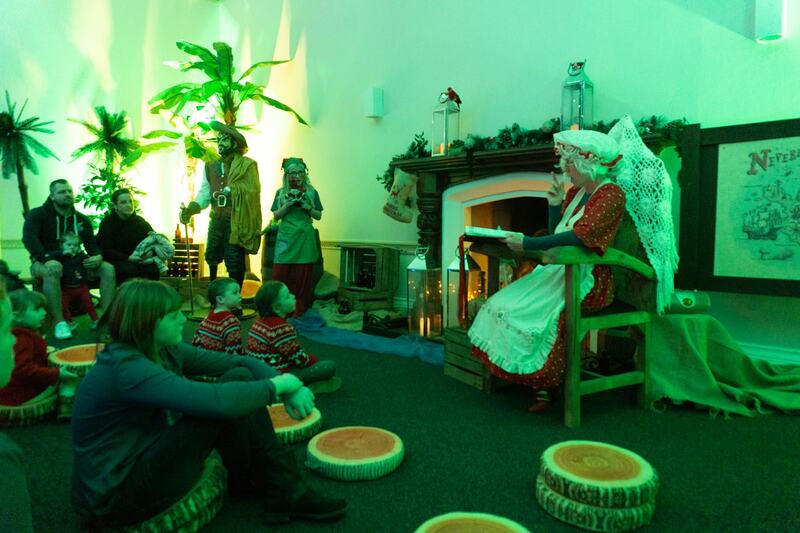 This wasn’t rushed at all, and as Father Christmas has his own room (toy workshop?) you’re not aware of the other families waiting to see him as they’re still busy in the craft room. Each child was given a beautifully wrapped gift and they fitted in the bags they had made too, so I didn’t have to carry them, hurrah! There is a photographer on hand to snap some pictures and once you’re ready to move on you go out through a different door and into the elves workshop, where there are some (stuffed!) reindeers and lots more things for the kids to look at in case the adults want to buy photos. There is a touch screen to use to look through them if there are people still waiting for theirs to be printed at the desk, and absolutely no pressure to buy them which I thought was nice, so often you get the hard sell at places where they take your picture! 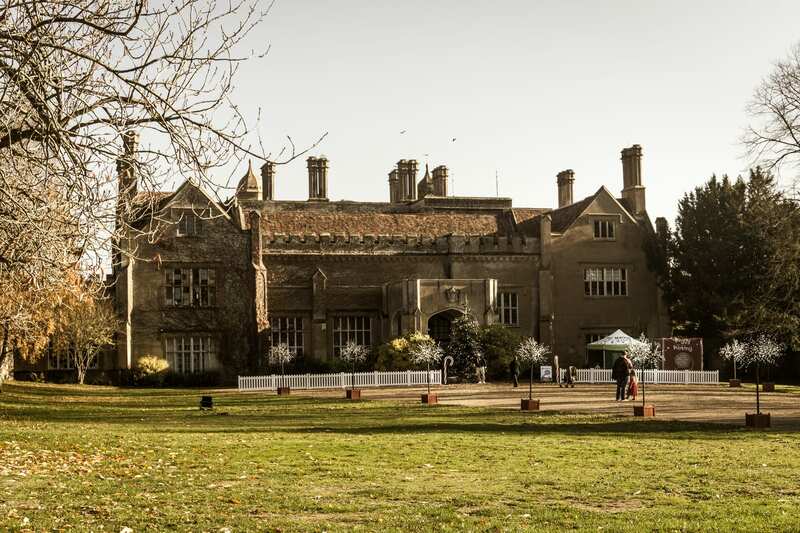 We did actually buy three photos though as the photographer got some lovely photos, for £15 we were given a print of each and also a high res photo sent to my email address so we can share them with friends or family. 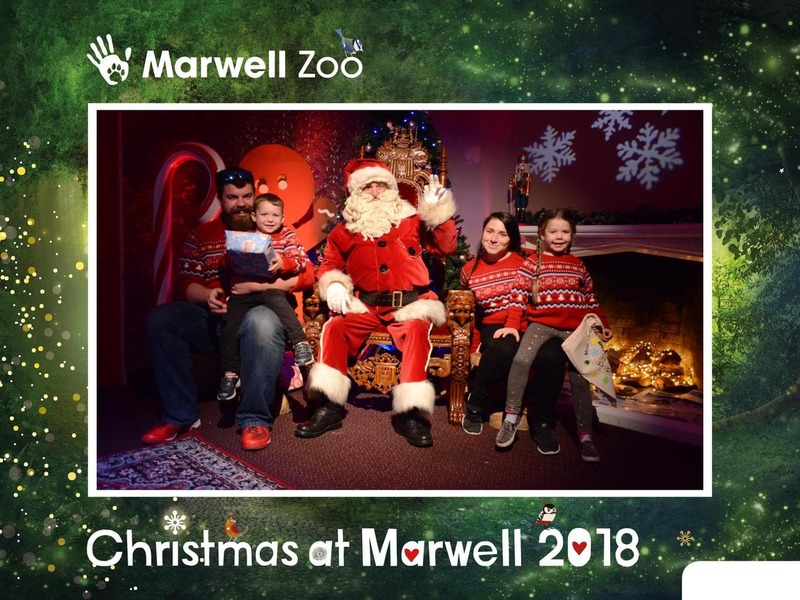 The whole Christmas at Marwell experience took just over an hour and ran incredibly well, like a well oiled machine run by festive elves, and I think it is a really special way to see Santa! By the way, the kids couldn’t wait to open their gifts and we let them open them at lunch – Arlo got a playdoh set with lots of tools and Athena got a lovely board game – so they’re not naff or cheap presents! We actually carried on our festive day with a roast turkey dinner at Cafe Graze, which was tasty! The kids had the picnic lunch box which got them refuelled for another couple of hours of exploring the Zoo. We visited the Tropical House for the first time too, as it wasn’t open on our last visit. The kids loved it (and it was nice and warm too) and though we didn’t spot the Sloth there were a lot of birds and fish to look at and also some ‘sciency’ bits as Athena called them! 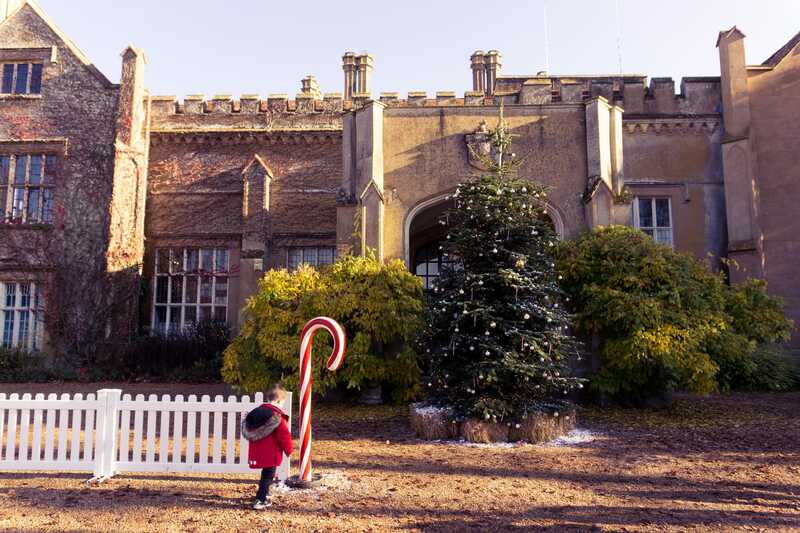 The Christmas at Marwell tickets give you full access to the park as well as your festive experience, and there are various dates available right up to the 21st December! 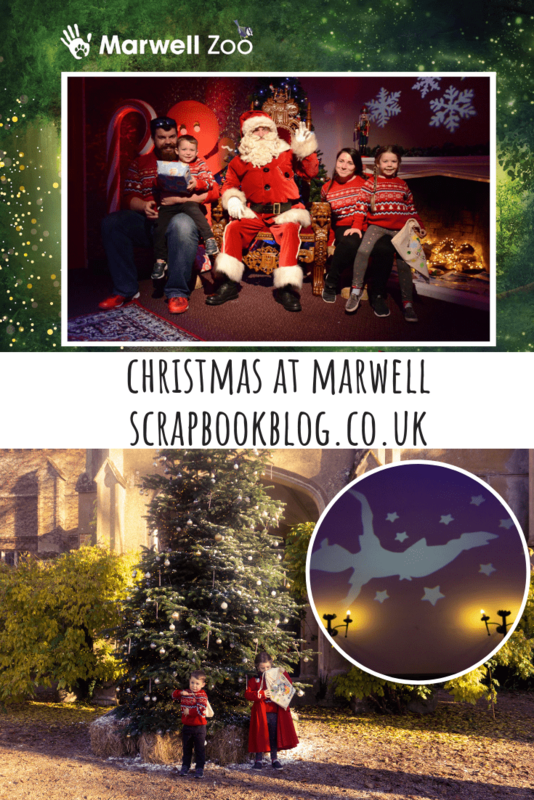 We were invited to experience Christmas at Marwell and review it on the blog, but we purchased our own lunch and photos. Next Post Festive gifts for Wine and Gin lovers! Sounds like you had a lovely day. I’m desperate to start bringing the Christmas decorations out. I have half days every Sunday in December and I can’t wait to take the kids to see Santa. It’s one of the best bits about Christmas isn’t it!